THE NEW LEVI’S STADIUM IN SANTA CLARA HAS ALREADY MADE ITS BIG IMPRESSION; BUT, NOW THAT ITS OPEN WITH A FIRST GAME EVENT; STILL, IN THE SHADOW, IS A HIDDEN PAST, AS WELL AS FUTURE MEGA-PROJECTS THAT ARE YET TO BE REALIZED. The first game event at Levi’s Stadium happened Saturday 2 August 2014, with the San Jose Earthquakes v. Seattle Sounders soccer. It may not be the largest stadium of the nation or the world, but Levi’s Stadium has no doubt transformed its greater vicinity and region. The stadium seats 68,500 people and will feature an expected 165 luxury suites and 8,500 club seats. It has been said to be expandable to 75,000. This stadium is large enough to be seen from neighboring San Jose, which includes standing points as far away as the Alviso Marina County Park (nearby the Don Edwards San Francisco Bay National Wildlife Refuge at Alviso), where San Jose meets the bay. Where it stands, Levi’s Stadium was formerly the 49ers football team’s own administrative offices and training facility at Santa Clara, California; but, now, this new edifice seems to take a zone of Santa Clara and bring it into a level of dynamics that is socially and economically different from its past. Already here, across the street, are the Santa Clara Convention Center (opened 1986) as well as California’s Great America theme park (opened 1976). Then of course, the convention center points out that there’s nearly 4,000 hotel rooms in this district. Don’t forget the additional improvements of light rail, wide streets and ample parking garages. Suddenly, the surrounding big-capital structures and event venues have found themselves in stark contrast to another “playing field” that still remains: Santa Clara Golf & Tennis Club. That club area includes a par 72 championship course measuring 6,704 yards; a variety of amenities and expansive practice facilities; 7 lighted tennis courts; as well as a clubhouse restaurant and banquet facility. But, all that may go away, if developers have their way with even bigger plans. Just across from the new Levi’s stadium, this golf course was once a landfill for garbage refuse; but, now, it’s got plans for redevelopment. It’s true, back in 1986 or so, the area’s landfill was covered to make a country club setting. Over the years, many people have played a game, as well as hosted weddings and other events at this site. It’s been a while since seeing restaurateur, David Ebrahimi, who owns and operates David’s Restaurant and Banquet facility from within the clubhouse; whereas, even he mentioned the past history of the golf course, as well as possible redevelopment plans in the near future. He wonders how developers will build here, give that it’s mostly a landfill. Like many other people, Ebrahimi perhaps assumes that this previous land use would have to be realized and considered, such as to remove the old waste, build over it… or whatever the case. After nearly 30 years, who knows what’s underground? Ebrahimi just shrugged, as if not to know. Yet he questions with great wonder. As people come here to the restaurant and sip on Arnold Palmers (a mix of ice tea and lemonade), a long-standing joke at the teeing green and fairway have been that there’s no smoking allowed along the way, such as for fear of sparking an explosion. Like many landfill “reclamation sites,” the golf course has methane wells, from which gas emits. While it’s not exactly true that lighting a cigarette will cause an explosion, visitors here have known about the uneven ground degradation that’s beneath their feet. That includes the expanse of added topsoil and green lawn upon which they now stand or drive their golf cart. Its often overlooked, since they don’t live here. They just play golf, enjoy a club sandwich, pasta, beef steak… whatever. They come here to take a drink from the bar and meet-up with friends. It’s in such conversations that it brings back memories. Stories of life in the old Bay Area are shared. Suddenly, its recalled how golf courses and club house restaurants have been considered an improvement to such sites, similar to projects elsewhere. In that sense, David Ebrahimi has something in common with Ted Faravelli, who owns a similar operation in Mountain View. Along the bay are Mountain View’s Shoreline Golf Links, Michael’s Restaurant and clubhouse, plus the Amphitheater. 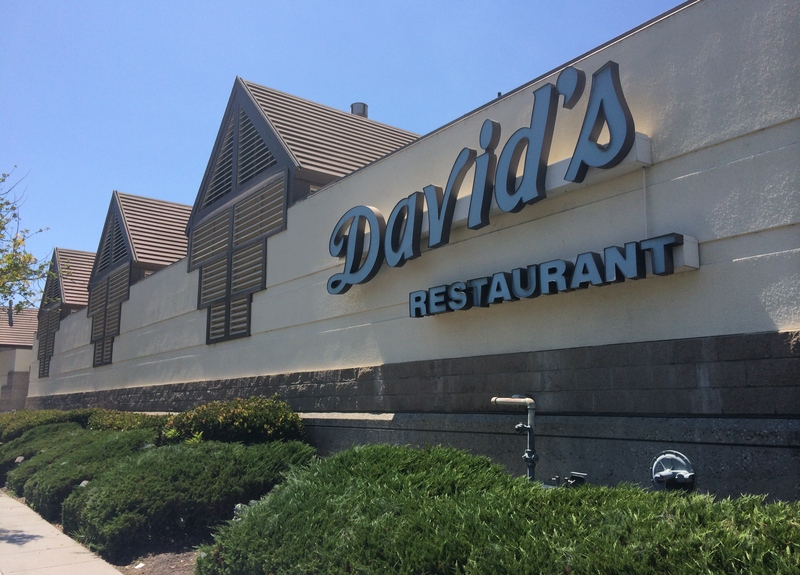 It’s a very similar venue to David’s in Santa Clara. At Mountain View, too, it was formerly a landfill made for reclamation. Still another example, which might be recalled from earlier this summer, included parts of Alviso; as that’s where a recent landfill caught on fire and caused smoke-filled winds to drift towards the new Levi’s Stadium. The new Levi’s Stadium is just yards away from the old dumps; that’s if not also a bird’s flight from where more dumps have been situated and then follow-out along the perimeter of the bay. Truth, however, is that many of such dumps have been covered and forgotten; but, some still remain. This is all reminiscent of a time before groups like Save the Bay made their impact, restricting “bay fill” and its waste and contaminants from entering the San Francisco Bay. It was a bigger practice than many current-day residents perhaps remember or have learned. But, it was just this last May 2014 — about two months before the new stadium opened — that Zanker Materials Recovery and Landfill reminded us that it’s not all “under cover.” The Zanker landfill became the site of a 3-alarm fire. That was on a day in which there were at least 10 other vegetation fires in the neighborhing city of San Jose. As a matter of fact, it was on a “Spare the Air” day that it all came downwind. NBC Bay Area reported that San Jose fire Cpt. Reggie Williams had said that “the wind was pushing the flames, causing spot fires to start. And according to NBC Bay Area Meteorologist Rob Mayeda, the winds were gusting at about 20 miles per hour, which was making it tough for firefighters to get the blaze contained.” That fire has also been called the Los Esteros Fire, named for the road at which the City of San Jose has its Zanker Materials Recycling Facility Project. The old state hospital — established in 1885, rebuilt and reused — certainly contrasts with more recent developments nearby; which, aside from the looming Levi’s stadium, these building projects are not quite over yet. That asylum is now an Oracle campus; whereas, surrounding the new Levi’s Stadium are also other technology companies and firms. Many of the workers in these companies and venues live in the relatively new residential developments, many of such which are built within the surrounding vicinity at the border between Santa Clara and San Jose. Indeed, looking at the area now, you would not necessarily recall that much of this area was once the place of refuse and the insane. Generations later, it has become gentrified and developed with mega-projects; therein, designed in a way that its original use is nearly forgotten. Just up the street from old Agnews — taking Lafayette Street and passing the front of the new Levi’s Stadium — its’s a 3 mile drive to where the Santa Clara Golf Club is located. And that’s the site of another proposed project. As the stadium has its big debut and fanfare, lesser talked about is the plans for the entire area behind David’s Restaurant, which nearly reaches out to the bay, except for the fact that the city boundary of Santa Clara does not reach that far. Also just below the South Bay Freeway-237 are a few office buildings including companies like Dell computers. Aside from there, at the Santa Clara Gateway, a strip of land on the opposite side of the freeway belongs to the City of San Jose; whereas, that’s what separates Santa Clara from the southern portion of the San Francisco Bay. Otherwise, this is a huge area that is bordered by Tasman Drive (south), Great America Parkway (west), the Guadalupe River/Coyote Creek (east) and a parcel line that is just shy of the South Bay Freeway (north). The ENA provides for an 18 month term (with an additional two 6-month extensions) in order for the Developer to address key issues such as physical and economic feasibility of developing on a former landfill site; potential relocation of public/private uses such as the golf course, BMX track, fire station, and other facilities; preparation of a project description and master plan for the Property; completion of an Environmental Impact Report; and securing entitlements. That new developer “on the block” (or maybe that should be plural) is known as Related Santa Clara LLC, which is in an Exclusive Negotiating Rights Agreement (ENA) with the City of Santa Clara. As noted in an agenda from 9 April 2013, the Bayshore Area houses usage for, as well as includes routes along, those sites such as the Santa Clara Golf and Tennis Club, David’s Restaurant, David’s Banquet, Santa Clara Fire Station #10, Parks Maintenance facility and PAL BMX track. In its documents since April 2013, the city has noted that the Related LLC has done analysis to determine “the physical condition of the Property; access and utility capacities; title condition and other items necessary to characterize the adequacy of the Property for development.” That language acknowledges that the “developer has conducted analysis on potential construction methods on the landfill; coordinated numerous meetings with local and State regulatory agencies about redevelopment of the landfill.” However, the said “conceptual land use plans,” as well as how Related LLC intends to excavate the landfill for development are not entirely known in detail, as that’s probably somewhere in what’s called “grey literature” ( i.e., lesser known published materials that are used between the city, developers and other partners). At this time, finding that information is probably a “dig” in of itself. What is more, it is not thoroughly known what will happen to the existing businesses that are more approximate to the proposed development site, such as when the landfill would be excavated; therefore, causing its composition to be exposed, pushed, unsettled and maybe further emitting its methane gasses. The City will retain title to the Landfill and have responsibility for the ongoing post closure operation and maintenance. Any cost associated with the installation and/or modification of the existing leachate collection system will be borne by the Developer. In other words, the city is using technical language to refer to the drainage or “run-off” from the landfill, including its chemical composition, as it effects the percolated water systems in that same area. In these regards, it’s not completely known if, or to what extent of, Related LLC will partake in landfill mining with particular influence to the air and water. Furthermore, would Related LLC contract that excavation to another party, such as a partner? If landfill excavation is proposed in an initial phase, what would be the timetable and to what expense and/or profit? In today’s world, waste is not simply a loss, as it can be processed and sorted and then turned into energy or other materials. Certainly, given the acreage, it would seem that mining the landfill would be an enterprise or phase unto itself, which is separate from its building project re-development. After 30 years of being underneath a golf course, the landfill’s hidden and intrinsic condition does not appear to be entirely known by the public. That’s with regards to its true tonnage, expanse of acreage and its depth. That’s also aside from the potential environmental impact that comes with digging it all up and so forth. Analysis and Environmental Investigation Reports (EIR) have been ordered, and so noted in the 5 February 2014 Agenda Report, but the supporting details are not all that transparent, if they are in fact ready. These reports were included in the City of Santa Clara “City Council Meeting Agenda” for 11 February 2014, therein considering plans of Related Santa Clara LLC; but, also, another project that is a joint venture of Lowe Enterprises and the Montana Property Group. That company name is for Montana, as in Joe Montana. Of course, he is the former San Francisco 49ers a hall of fame quarterback, who is now a partner in a project that will sit adjacent to the that team’s new stadium. a proposed $400 million mixed-use, phased development that will include 622,000 square feet of hotel, retail, restaurant, and office space at the corner of Tasman and Centennial, north of the Stadium. a proposed $3.5 billion mixed-use, transit-oriented development that would include more than 5.2 million square feet of retail, entertainment, restaurant, hotel and office space. Despite these very questionable challenges to the named projects, the architectural designs — in of themselves —are in fact striving for better environmental standards. So, if they developers can safely excavate the site and replace it with new development, its an incredible achievement. This includes the new Levi’s Stadium and its possible expansion and improvement; The Centennial Gateway; plus, City Place Santa Clara. Meanwhile, both of the new projects are projecting what’s called “LEED Gold certification.” The long name for that is “Leadership in Energy and Environmental Design” and it means that the projects will be design, constructed, operated, and maintained with “green” or environmentally responsible and resource-efficient practices. It raises the standard even higher. Gold is the third best of this four-level certification program: i.e., certified, silver, gold and platinum. Still, the game is not over. The stadium is built; but, these other proposals — including their environmental reports, landfill reclamation and redevelopment — have yet cross into the “end zone.” To make that touchdown, there’s also a number of other concerns, like public zoning, lease agreements and so on. Don’t forget, it’s also about team-work, wherein there’s reliance on a series of partnerships, contracts etc. At that, the team has to make it happen. That may be a bigger deal than the Superbowl itself. This entry was posted on Saturday 2 August 2014 by de·Anza Post in San Jose, CA, Santa Clara, CA and tagged 3-alarm fire, 49ers, Agnew Road SC, Agnew's State Hospital, Alviso, Alviso Marina County Park, bay fill, BMX, CA, California's Great America, City Place Santa Clara, club house, Coyote Creek, Cpt. Reggie Williams, David Ebrahimi, David's Restaurant, degratation, Don Edwards San Francisco Bay National Wildlife Refuge at Alviso, EIR, ENA, entertainment district, Environmental Impact Report, excavation, Exclusive Negotiating Rights Agreement, football, golf course, Great America Parkway SC, Guadalupe River, Joe Montana, Lafayette Street SC, landfill, landfill excavation, landfill mining, Leadership in Energy and Environmental Design, LEED Gold certification, Levi's Stadium, Los Esteros Fire, Lowe Enterprises, Meteorologist Rob Mayeda, methane, Michael's at Shoreline, Montague Expressway SC, Montana Property Group, Mountain View CA, NBC Bay Area, North Bayshore Area SC, North First Street SJ, Oracle, reclamation, Related Santa Clara LLC, San Francisco 49ers, San Francisco Bay, San Jose CA, San Jose Earthquakes, San Jose fire Cpt. Reggie Williams, Santa Clara, Santa Clara City Council Meeting Agenda, Santa Clara Convention Center, Santa Clara Gateway, Santa Clara Golf & Tennis Club, Save the Bay, SC Fire Station #10, Seattle Sounders, Shoreline Amphitheater, Shoreline Golf Links, SJ Fire Station 29, South Bay Freeway 237, Spare the Air, Super Bowl 50, Superbowl, Tasman Drive SC, Ted Faravelli, The Centennial Gateway, The Great Asylum for the Insane, Zanker Materials Recovery and Landfill, Zanker Materials Recycling Facility Project, zoning.